This topic was published by DevynCJohnson and viewed 1414 times since " August 01, 2015 @ 06:00UTC ". The last page revision was " October 30, 2015 @ 11:58EDT ". 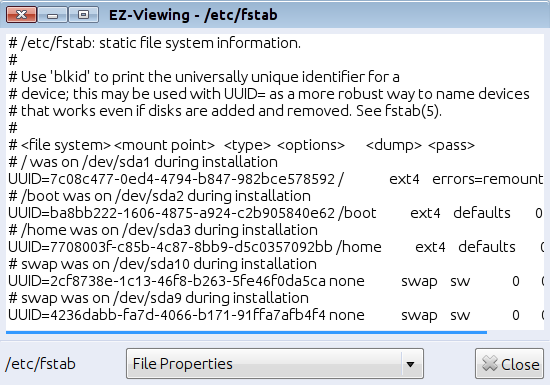 Ezv-fstab is GTK3-GUI that displays the contents of /etc/fstab. There is a Python3 script and a standalone x86-64 Linux application. Just extract the file and run it. No software is needed when executing the stand-alone executable. The stand-alone executable may work on many other Unix and Unix-like systems that are x86-64 compatible. However, I have only tested this software on Ubuntu and Linux Mint. Ezv-fstab was created by Devyn Collier Johnson <DevynCJohnson@Gmail.com> in 2014. Feel free to distribute and make copies of this open-source (LGPLv3) software.